I’m driving home from bowls yesterday, lawn bowls that is, when my cellphone rings. It’s my beautiful daughter-in-law who informs me that my Facebook page has been ‘hacked’. I’m very surprised and somewhat dubious, I use a very strong password for Facebook and change it quite regularly, because it’s one of those sites that I rate as being critical. My foot presses harder on the accelerator, I’m keen to get home and check this out. Arriving home, I rush inside, straight to the computer. Sure enough, there are numerous email notifications from Facebook and this activity is also reflected on my Facebook page with lots of comments from concerned ‘friends’. There is, however, no sign of any defacement on the page, no foreign posts from unknown sources, so my fears of a hack are somewhat allayed. To be on the safe side, I change my password and also check through the settings to make sure all are as private as they possibly can be… all good. Seems someone calling themselves James Hillier has been contacting people in my friends list with friend requests. Apparently, this person is impersonating yours truly, starting off with some idle chit chat but then moving on to pushing some kind of ponzi scheme which, of course, requires an ‘investment’. I searched for “James Hillier Facebook” and sure enough, there are two different pages for James Hillier both using the exact same image of me. Someone has downloaded my avatar (pic) and used it to set up a bogus page under my name. Unlike my actual page, the fake page is pretty bare, with no posts or information at all, just a name and large picture of myself. What concerns me most at this stage is how this person managed to find out who is listed among my friends, this information is set to Private and shouldn’t be accessible. Then just follow the prompts. I am left wondering how long it might take Facebook to act on this, but not for long. Within a matter of a minute or two, the offending page is gone. I can’t believe my eyes, it happened so quickly. Kudos to Facebook on that score. We reviewed the profile you reported for pretending to be someone they’re not. Since it violated our Community Standards, we removed it. Thanks for your report. We let James Hillier know that their profile has been removed, but not who reported it. I wanted to tell them that I AM James Hillier, the other person to whom they are referring is not James Hillier but someone impersonating James Hillier. However, the email they sent was a “no reply” and I couldn’t find anywhere onsite to communicate further about this matter. My two daughters have since informed me that this is not an unusual occurrence. Apparently, people impersonating someone else on a bogus Facebook page in the hopes of gaining trust so they can push some sort of scam is fairly common place. I still don’t understand how they manage to gain access to friends. Perhaps someone much more conversant with the vagaries of Facebook than I could enlighten us? There are obviously a lot of devious minds out there, coming up with schemes which wouldn’t even enter my head. I’m just grateful to Facebook for acting so quickly to remove the offending page. Thank you Facebook! Prev:The ‘FREAK’ Vulnerability – Internet Explorer Users Note! Yet another reminder not to let our guard down. That’s why I don’t Face, Tweet, link or any other site of this type. My e-mail is forwarded through two sites to clean spam, If I haven’t requested info from you it’s trash. Just further confirmation to avoid so-called social websites like the plague. If this wasn’t so bad it would realy be quite funny. I’m glad things worked out OK. I guess Facebook can be nice at times too. Not just “money hungry”. The “nice” may have been due to their fear of a potential lawsuit. I can’t be sure but the speed of action by Facebook suggests to me an automated system, which simply ‘reacts’ to reports of bogus users and the like. I’m not sure where you get the idea that your Friends list can be completely private. I went to FB and saw nothing about that. 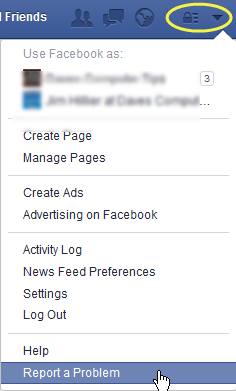 I believe you can set FB up so that only friends can see your full page, but then they could see your other friends as far as I can tell. If you set the page so that no one can see it (if that’s possible) what would be the point of having it? ‘Private’ as in restricted to one’s invited friends only. As opposed to open to everyone, which would be ‘public’. Has anyone ever told you that when you’re not familiar with something, it’s best to keep schtum.